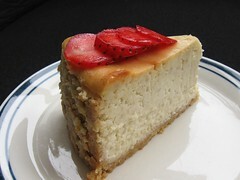 Guava Cheesecake with a Cashew Ginger Crust - Do You Know The Muffin Man? Notes: Argh, another poorly proofread recipe: there's no mention of ginger anywhere except for in the title! In the crust mixture, I food processed some diced candied ginger (about two tablespoons) along with the cashews and also added a half teaspoon of ground ginger. Instead of a 9" springform, I used an 8" cake pan that had 3" sides, my first time trying it this way. For easy removal, I lined the bottom with a circle of parchment. My guavas weren't fully ripe and the food processor could only produce a coleslaw-like mixture. After adding some sugar and a few spoonfuls of water, I was able to get a puree with finely chopped fruit bits. Instead of mascarpone, I used sour cream, which is by no means a substitution but I had some in the fridge. When I made this a few years ago, I got rave reviews but I was sick at the time and couldn't taste much of anything. There isn't very much of a guava aroma that I can taste. Either I'm not using the right variety of fruit or they're not fully ripe, or, I don't have the right guava gene to detect its flavour. The crust is excellent, perfect cashew and ginger flavours. As for the filling, the bits of fruit in the creamy centre provide an odd, but delicious contrast.